Cannot attend this event, please send me any future events, news or updates. This is not a ticket. Organic and CODAME have come together to bring you code-generated art by REZA. The Adopt-an-Artist program is an experiment that invites you to learn and play. Artists are currently struggling to maintain their practice in San Francisco. This collaboration marks Organic’s efforts to sustain the arts in this city. We are excited to showcase Reza Ali's work at Organic. Organic is a leading marketing agency grounded in digital that successfully blends creativity with unmatched predictive intelligence. By creating and continuously testing and optimizing marketing systems, Organic helps global brands accurately predict outcomes, spot trends, identify behaviors, and create a much deeper connection with consumers. Founded in 1993, Organic has offices in San Francisco (HQ), New York, and Detroit. Thank you Organic for the ART+TECH support! Reza is a new media artist and researcher. His work and research is centered around computational design, user interfaces, software studios, and wearables (hardware + software + form). As an artist, he uses technology (code, form and electronics) to express himself. His works manifest themselves as either visual art, spatial sculptures, and interactive installations. Reza is interested in the ideas and implications of his works, tools, and way of working. As a researcher, Reza is passionate about solving complex problems by creating new technologies and open sourcing them to allows others to build on his work and build the future. As an artist and researcher he is deeply interested in the feedback cycle that occurs when customs tools are written to accomplish an artwork, and how those tools can enable artworks to go beyond what the artist had originally envisioned. He hopes to change the world by making a difference in how people use technology, design products and experience new media art and entertainment. About: FluidScapes are about making the invisible visible and the interplay of two generative systems. These images are snapshots in time of a simulated fluid field affecting the height of a generative terrain made from particles and springs. Custom software was used to simulate and visualize the generative systems interplay with each other in real-time. In this exhibition the FluidScapes have been rendered as prints, but they exist as digital files which can be 3D printed or CNC machined into FluidScape Sculptures. 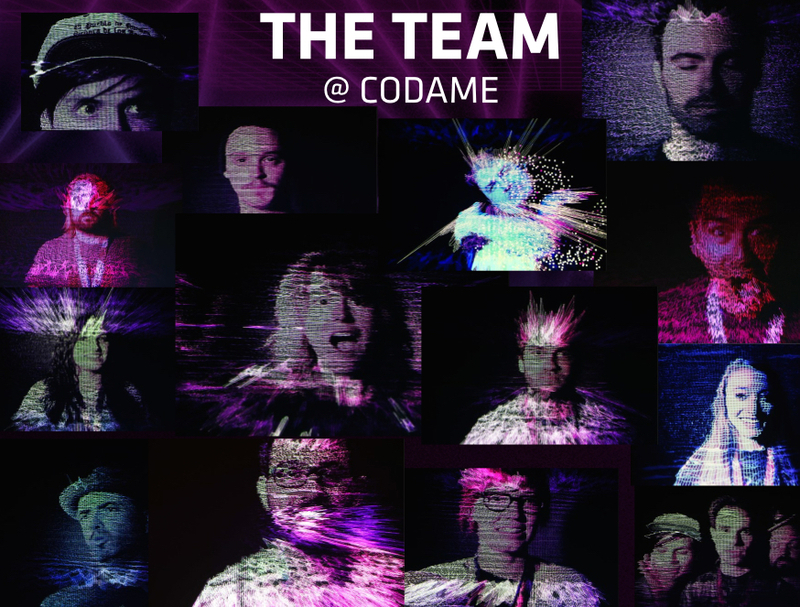 CODAME forms the future through inspiring experiences and playful ART+TECH projects. CODAME events, installations, and workshops connect people of all specialties and backgrounds. Join us to continue the visionary celebration, running since 2010! Leveraging technology for creativity requires cultivation. By valuing questions over answers CODAME creates spaces encouraging exploration and discovery. Artists, entrepreneurs, innovators, amateurs, and leaders are all welcome on our journey. Startups, corporations, non-profits, and collectives alike have participated in CODAME style way-finding! Members of Intersection for the Arts a 501(c)(3) non profit organization. Sparked by the network of creative coders, designers, and artists that Jordan Gray and Bruno Fonzi knew from around the world, CODAME was founded to passionately celebrate art and technology. The CODAME brand of immersive, engaging, and out of the ordinary experiences was coined at the inaugural CODAME ART+TECH Festival in 2010 on a foggy rooftop in downtown San Francisco. Download the full resolution logo assets (1.5mb). Includes full color version, black on transparent version & white on transparent version as maximum quality PNG. Web optimized (full resolution with ImageAlpha/ImageOptim applied) PNG here. And infinite thanks to our friends and allies through the years: Kevin Koechley, Olia Pospelova, Alfred Dominquez, Irene Grossrubatscher, Dat Phan, Justin Kinder, Jaquie Bacich-Paratt, Valerie Alloix, Stefano Corazza, Kiri Rong, Vicky Chen, Karen Hsu, Nancy Garcia, Julie Goldsmith, Allen Ellison, Drew Clark, Tarwin Stroh-Spijer, Bernie Samson, Tiare Ribeaux, DC Spensley, Lauren Anderson, Michael Conover, Andrea Starr, Felipe Brahm, Hanna Regev, Jesse Fulton, Misaki C. Kido, Jonathan Wallraven, Julia Sun, Lauryn Porte, Kimmy Colombo... and more than 200 more amazing artists, technologists, and volunteers! CODAME Code of Conduct for all participants and attendees.